It’s an often-overlooked period in history, but the Spanish-American War had long-reaching consequences for the United States. 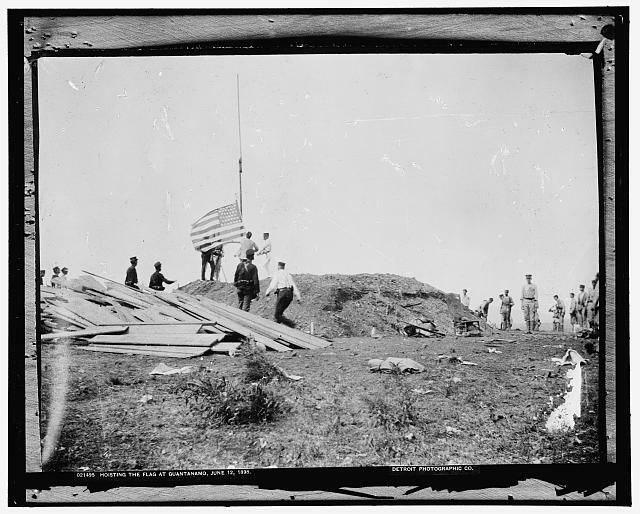 On June 10, 1898, the first US ground forces would land in Cuba, at Guantanamo Bay on the eastern side of the island. Their landing site would give rise to an American military station that still exists today, albeit under clouds of controversy due both to our usage of it as a terrorist dumping ground and our not-so-wonderful relations with Cuba. The war itself would drag on until the Treaty of Paris on August 12, 1898. The Spanish got rid of the costly remains of a burdensome empire (to the tune of about $20 million), and the United States, the country that staked its reputation as a beacon of freedom against colonialism, suddenly adopts colonies of its own. It led to troublesome relations with Cuba (occupied by us until 1902, and you know plenty about the rest), Puerto Rico (where the parade comes from, and which we still have) and the Philippines (which after a bloody insurrection and surrender to the Japanese, we finally gave independence to in 1946). (1) The real hero of San Juan was not Theodore Roosevelt, but rather Lieutenant “Black Jack” Pershing and his Buffalo Soldiers. Fresh from the Indian wars, these black soldiers were among the ONLY US military personnel in Cuba with any combat experience. If they weren’t covering Roosevelt’s right flank, the battle would ended very differently. (2) Our naval forces were modern in 1898, but our land forces were a different story. While outnumbered, the Spanish had Model 1893 Mauser rifles and Maxim machine guns that would be used less than 20 years later in the trenches of World War I. Our boys were equipped with the Krag-Jørgensen Rifle, a complex, one-at-a-time loader that was difficult to clean and put together. It served the shortest period in the US Army, until 1903. As for automatic weapons, we still slung around 1862-model Gatling crank guns, but we also had M1895 Colt-Browning guns that spit out casings through a weird lever action. It wasn’t until after this war that the US Army did a drastic overhaul of weapons, tactics and uniforms, finally putting the blue jackets to rest. you know. The design look great though! Hope you get the problem solved soon.